“I need a car seat as an extra one for the grandparents. I don’t want to pay a fortune as it’ll only be used occasionally. I know, I’ll have a look on eBay! Wow there’s 3,983 for sale – loads of choice! The scenario you’ve just read occurs nearly every day. 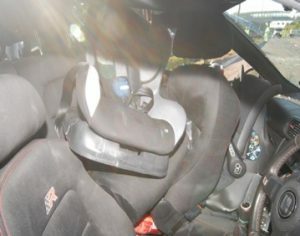 Someone buys a second-hand car seat from an online site or a car boot sale. 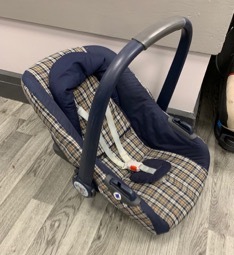 The picture/item looks great, and the owner says it’s in good condition and hardly been used. However, you really don’t know very much else about it at all, do you? The scenario in question refers to a real advert. Let me tell you that this actual seat, when checked over by our team, was found to be safety standard tested to R44.03, which has not been reproduced since June 2006. This seat was thirteen years old at least, and there have been two more safety standards in operation since then. Since all seats have a production date written on them, we found that this one was actually made in May 1998! It’s 21 years old! The lifespan of a car seat is around 5 to 6 years due to wear and tear on the harness, buckle and plastics etc. All these things deteriorate, especially when kept in cars, sheds, garages and lofts. You also wouldn’t know if it had been damaged having been involved in a crash, as we simply can’t see inside the seat. By the way, you can buy a brand new one tested to R44.04 with side impact protection for £29.99 if you shop around! Sadly, there are two child seats in this crash photo. You certainly couldn’t use one but the other may look if sold as second hand! It’s not been involved in any type of crash or collision. It’s not more than 6 years old (every seat has a date on it and you can always google how to find where it’s stated). There’s no damage to the plastic or polystyrene. The buckle fastens with a good solid click. The harness isn’t worn and hasn’t been cleaned with baby wipes or anti-bacterial spray etc, as these burn and weaken the harness. You can tighten and loosen the harness easily. There is an instruction book explaining how to fit, adjust and use the seat. The seat fits securely into your vehicle. Remember that we all want to ensure we are using the best car seat we can that will give the best protection to our very precious cargo. We’re always happy to give advice and answer questions, but look out for future blogs relating to each of the points listed above in your go-to checklist!